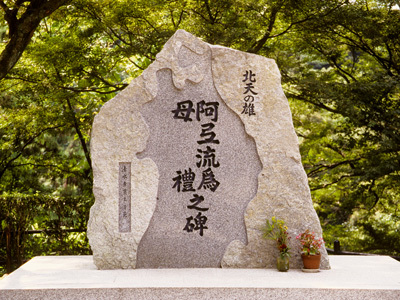 Memorial, Kyoto, Japan, 1995. Canon A2E, Fujichrome, 1995. Mijo Castle, Kyoto, Japan. Canon A2E, Fujichrome, August, 1995. Rock Garden, Ryoanji Temple, Kyoto, Japan. Canon A2E, Fujichrome, August, 1995. Temple Roof, Nara Prefecture, Japan, Canon A2E, Fujichrome, August, 1995. Skyscraper, Hong Kong, China. Canon A2E, Fujichrome, August, 1995. Battlement (with series of merlons, crenels and loopholes), Beijing, China. Canon A2E, Fujichrome, August, 1995. Chinese youth, Shanghai, China. Canon A2E, Fujichrome, August, 1995. Statue of Mao Zedong, the Bund of Shanghai on the Huangpu River, Shanhai, China, Canon A2E, Fujichrome, August, 1995. Red door, "Forbidden City" (Zijin Cheng), Palace Museum, Beijing, China. The "Forbeidden City" was bult between 1406-1420; its construction required more than one million workers. Canon A2E, Fujichrome, August, 1995. Signs and arrows, Kyoto, Japan. Canon A2E, Fujichrome, August, 1995. Horyu Temple of the Flourishing Law, Nara Prefecture, Japan. Dating from 607, the temple's pagoda is widely acknowledged to be one of the oldest wooden buildings in the world. Canon A2E, Fujichrome, August, 1995. Great Wall of China (Changcheng), Beijing, China. The entire Great Wall was built and rebuilt between the 5th century BC and the 16th century; it stretches for 5,500 miles. China. Canon A2E, Fujichrome, August, 1995. Young woman, Great Wall, Beijing, China. Canon A2E, Fujichrome, August, 1995. Forbidden City, Beijing, China. Canon A2E, Fujichrome, August, 1995. Oriental Pearl TV Tower, Shanghai, China. Located near the Huangpu River across from the Bund of Shanghai, the Pearl was desigend by Jiang Huan Cheng and completed in 1995. At 1,535 feet high, the TV tower is one of the tallest structures in China. Canon A2E, Fujichrome, August, 1995. Kinkaku-ji Temple, Kyoto Japan, Kinkaku-ji was originally constructed in 1397. It was burned down in 1950 by a monk. The temple was rebuilt in 1955. Canon A2E, Fujichrome, August, 1995.